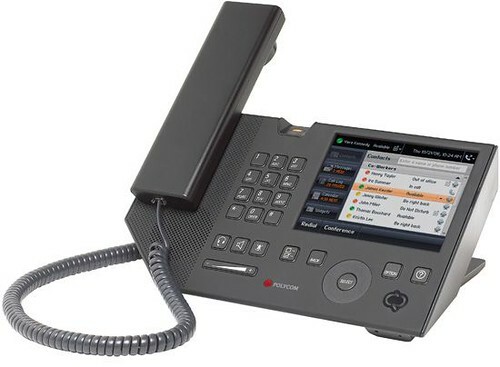 마이크로소프트 엔터프라이즈용 VoIP 서버인 OCS2007(Office Communication Server 2007)에 옵티마이즈된 VoIP단말기가 공개되었다. 공개된 단말 중에 가장 눈길을 끄는 것은 Polycom의 CX700이다. 여기에는 MS의 Communicator 인터페이스가 그대로 들어가 있어서, 웹페이지에 접속하지 않아도 전화기 인터페이스 내에서 대부분의 정보를 얻을 수 있도록 되어 있다. 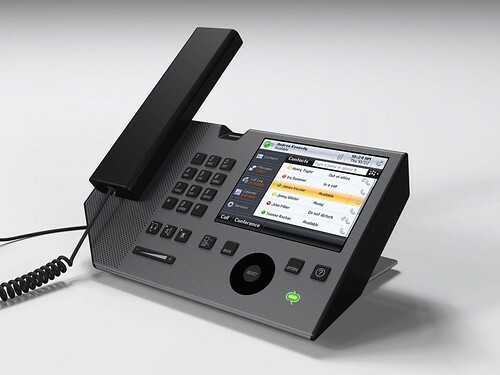 Easily monitor and manage your calls through the Windows CE-based touch-screen interface. lick-to-call with name-based calling from a user’s contact list or call logs. Enhanced incoming call information lets users quickly decide how to deal with a caller. 다음으로 살펴볼 제품은 LG노텔에서 개발한 IP Phone 8540인데, 아래 그림을 보면 아시겠지만 Polycom의 CX700과 너무 흡사하다. LG 노텔이 폴리콤으로부터 OEM으로 공급을 받았거나, 아니면 그 반대가 아닌가 추측될 정도이다. 이 제품이 제공하는 기능 또한 위의 폴리콤 CX700과 대동소이하다. 또한 현재 스카이프 엑세서리로 이용되고 있는 Polycom의 CX-100도 마이크로소프트의 OCS2007에 옵티마이즈되었는데.. 이 제품은 USB기반의 스피커폰 기능을 제공한다. 무선 헤드셋인 Jabra GN9350도 Office Communicator(PC에 설치되는 소프트폰)에 최적화되어 소개되었다. 이 외에 소개된 악세서리 성격의 제품을 살펴보면 다음과 같다. LG-Nortel Bluetooth Headset (IP8502) is a Bluetooth wireless solution (with USB-to-PC connectivity) that is "optimized" to work with Microsoft Office Communications 2007. It's just your standard USB/Bluetooth wireless device, that allows you to make or receive calls on your PC without speakerphones as well as hear any PC audio applications wirelessly, but Microsoft has stamped it OCS 2007 "optimized". 이에 대한 자세한 내용은 Tom Keating의 블로그를 참고하시기 바란다. 마이크로소프트의 이번 발표에 대한 비판적인 입장은 GigaOM을 참고하시기 바란다. 마이크로소프트가 웹 비즈니스에서 구글과 힘겨운 싸움을 벌이고 있는데, 과연 VoIP에서 기존 엔터프라이즈 솔루션 강자인 Cisco, Avaya 등과, 그리고 최근 엔터프라이즈 시장 공략을 가속화하고 있는 스카이프에 맞서 선전할 수 있을지 궁금하다.